The onslaught of negative energy on Earth continues. We know that by sending these messages frequently we risk repeating ourselves, but because the times are so fraught, you need our support. We will therefore take the risk. Because cruelty, violence and instability are on the rise on your planet and will continue to escalate, you are being called to grow in strength and stability. The crazier life on Earth becomes, the steadier you will need to be. How to do this??? There is a heavy energetic fog hovering over the Earth now that nothing but light can penetrate. 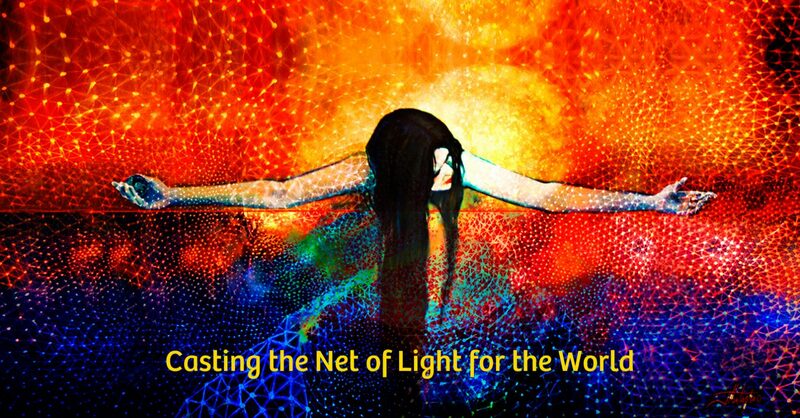 You hold this light and your heart, anchored in the Net of Light, can broadcast it throughout time and space. Whether you know it or not, you are a Beacon in a dark time. How then to more fully be that??? To lift the heavy vibration of fear that’s threatening to smother this planet, lift your own vibration. 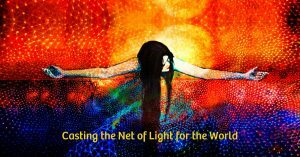 Do this with sacred song, prayer, and chanting, by working with the Net of Light, and do it with service. These acts will dissolve fear. Repetitive chanting, singing a beloved prayer or song will dissipate the veil of darkness. Repeat one name of God over and over again, chant the Lord’s Prayer, the Gayatri Mantra, the Samasta Loca, the Ho’oponopono or any sacred text. Repeat it until it becomes automatic, as natural as breath. Give your time, energy and aid to those who need help. Jump into service and don’t be afraid to try something new. The need is now! By doing service not only will you help others, you will dissolve the barrier of separation between human beings. So be brave. Dive into service and lift your own vibration as well as the vibration of your beloved Earth. You are needed and we are asking you to step into this need. If you want to know how and where you can serve, call on the Net of Light and ask us. And because we love you, we will direct you to what will give you joy.